The premise to The Guardian of Threshold had a lot of promise. 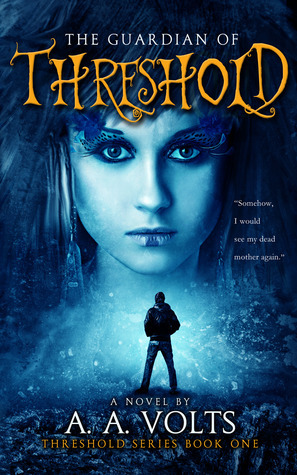 A boy named Mark has discovered a way to potentially see his dead mother again in what is called the Astral Realm, basically the world or dimension of the dead and those who can travel there in their sleep. Like I said, the concept is quite intriguing. In then end, the book was an utter disappointment. The majority of the book I spent completely annoyed, perhaps even angry, with Volts writing style. The first person style combined with what I assume was an attempt to relate to a YA audience entirely annoyed me. Parts of the dialog were so pointless that I literally had to keep from throwing the book across the room in disgust. Take a look at the example below. “Huh? Oh… thanks,” said Jonas, making a funny face by twitching his nose. “Can I use the restroom?” asked Carla. “You guys are already going to bed?” asked Jonas in disbelief. “Ah, yes, it’s almost 11:30p.m.,” replied Carla, looking at her watch. “So? Tomorrow is Sunday. We can sleep in late,” replied Jonas. Details such as Carla asking to go to the restroom are parts of Volts story that simply make the story long and boring. Nobody cares that she needs to use the restroom unless something of importance is going to happen. Normally I’m pretty forgiving of grammatical errors and even sentences or paragraphs that are a little uncomfortable, but this book was riddled with ridiculous dialog as the quote below showcases. “Look! Is that Senator Kennedy?” said Jonas, pointing toward a signed photo of Kennedy on the wall just as the waitress showed up to take our orders and drop off a basket of breadsticks. “These are really good,” said Jonas, eating one. Shortly therafter Jonas’ character repeats almost the same line about his food being good. Margaret came by and dropped off our meals. That played zero part in the plot; it played zero part in any entertainment value of the story. It felt as though someone had told A.A. Volts that in order to be a good writer, you need to include as many details as possible and he took it as simply recording every thought a person might have in real life. Descriptions of things that are entirely obvious were either demeaning or simply a waste of time that I wasn’t sure I would make it through the book. Descriptions of mountains as being huge, as if we didn’t know mountains were huge. How about describing the mountains in a way I can picture said mountains in my head by explaining if they are snow capped and covered in a blanket of centuries old pine trees. Not just, they are huge. Really? Few, nay, no book has ever made me so upset while reading it as this book has. I even held off posting this review for a couple months just to be sure I’ve let it sink in so as to try to be objective and I have returned now to write this final paragraph and my disdain for the writing style has not waned. Alas, I still had to give the book 2 stars instead of just one because I loved the concept of the story. The plot was good, it just wasn’t well executed. I won this book on a First Reads, Goodreads.com giveaway and was very excited to read this. I’m just glad I didn’t spend money on the book. It was still worth reading but only because it was free. 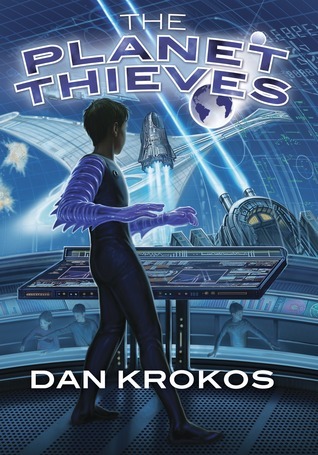 This was surprisingly a very solid Sci-Fi middle grade level book from author Dan Krokos. I’ll be honest, the cover actually had me a bit concerned I wouldn’t like the book. Good thing I didn’t let my judgement of the cover keep me from actually reading the book. I won an Advance Readers Copy of this book from a Goodreads First Reads giveaway, so perhaps that was another reason why I actually read the book. It could have also been because the book was so short. No matter what the reason, I’m very glad I read the book and am hoping Krokos follows this one up with a sequel. The story starts with a young thirteen year old cadet named Mason Stark. Mason’s ill timed practical joke on his older sister sparks a series of events that winds up putting the young boy in the captains seat of the Egypt spaceship fighting earths arch enemy the Tremist. Humans and Tremist have been fighting for centuries, and that centuries old battle has become Mason’s responsibility to broker a deal with the Tremist to save Earth, the Tremist planet of Skars, and Nori-Blue, the planet both want and are willing to do anything to get. There is an unexpected twist, of course, that takes the story in a completely different direction. I don’t intend on spoiling the story, so I’ll stop this portion right here. My recommendation is that you read the book yourself. This is apparently Krokos’ first attempt at a middle grade level science fiction story and I thought it was very good. I’ve not read any of his other work, but I felt the story was put forth in such a fluent way that you really feel the story could be real, even though it’s always a little hard to get past the idea of a 13 year old kid becoming captain of a star ship.I look forward to a hopeful sequel to this story. I give this book 4 out of 5 stars and highly recommend it to others. 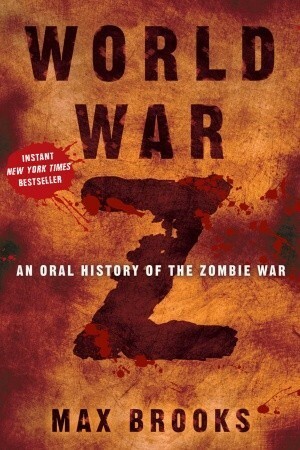 I was excited when World War Z by Max Brooks had come available at my local library. I quickly downloaded it to my Nexus and started reading. Having read The Zombie Survival Guide last year, I had high expectations. As far as I know, there is nobody who has more knowledge about Zombies than Max Brooks. The details regarding how a Zombie acts and thus, how we as humans should or should not react is certainly Brooks’ domain. This story was very different from the aforementioned Survival Guide. Namely, this was not written in the tongue-in-cheek style. It was written as a series of interviews with survivors of the Zombie Apocalypse or World War Z.
I found, at times, this style was a little hard to follow. I couldn’t remember who was who and where they were at. Jumping back and forth from different accounts was great for all the details, but it was difficult to develop the characters in my own mind as we jumped around. Needless to say, the story was solid and even with the somewhat strange format, I was intrigued enough to continue reading. The biggest disappointment was the ending. The end really just doesn’t do anything. There is no end, which I suppose is what the real ending to a zombie apocalypse would be. No real closure, no real end, just, the end. I liked the book, but I think it could have been better. I gave this book 3 out of 5 stars namely because of the confusing writing style. I won this book via the Goodreads.com First Reads giveaways and was cautiously excited to begin reading The Singular Six. I wasn’t planning on making this one my next read, but having had to return my copy of Inheritance to the library before finishing, I needed something while I waited, and this was the first book I grabbed. J.S. Volpe has begun The Chronicles of Eridia series in a very intriguing way. We are introduced to three of the six main characters right away as they battle a band of criminals in a post cataclysmic world. We quickly discover that one of the main characters is Frankensteins monster in the flesh (or someones flesh I guess). One of the young ladies with him is taken by the gang. This begins the quest to rescue not only the young lady who was with Frankenstein but to also save all of the kidnapped women from the town of Sweetwater. This is where the weird really gets started. The group of three becomes four, one of which is a super hero. Then, they meet two more to make it six. Without getting into too many details, there is a giant talking jaguar, rabid childrens toys, a three headed serpent, and a crazy teenage queen among other strange characters. I was captivated from the beginning. I think it was primarily because of the insanely odd characters, but more so the story and world that Volpe was drawing before me. The characters are slowly realizing along with the reader how all of these strange characters have come about and what this cataclysmic event may have been. I’m excited to read the next chapter of this series. I hope it continues being ridiculously absurd and enjoyable. In terms of a Sci-Fi/Fantasy story, I felt it was great, because it was so different, but also because it was a very fluid story. It was a quick read, and it always felt natural. The only critique I have, was more of an observation. I noticed that as the book matured towards the end, the profane language increased. Granted, there was more action, and that may be the reason. I didn’t find it distracting or detracting, but I simply noticed the amount wasn’t consistent throughout the book. I highly recommend this book to all Sci-Fi/Fantasy lovers. This book will not disappoint, and is looking to continue entertaining throughout the series. I give this book 4 out of 5 stars. This is the next short story in the series of short stories in this book. Click Here to see the first review and a link list of the other stories I’ve reviewed in this book. I enjoyed this story. It was a quick and interesting story about a young girl who is passing on her grandmother from 27 generations ago story of their planets history and how they came to live on the “Ship”. There was action, suspense, and great character development in such a short story. My favorite genre is Science Fiction/Fantasy and I felt this story could easily become a novel, or even a series. The idea of a planetary system in which there are possibly millions of planets all governed by a distant planet in which communications and interactions can take years to occur is truly fascinating. I was left wishing there was more. I won’t get further into detail as I don’t want to divulge too much of the story, but I would highly recommend those who do and those who do not enjoy Sci-Fi read this story. This was my first “First Reads” book giveaway win from Goodreads.com, and I finally got to read it. This copy was a pre-release edition of the book which, as indicated on the cover, was not the final edit version. Knowing this, I had to disregard all spelling, grammar, and punctuation errors. There were a fair number of mistakes, but it did not detract from the story at all. The story is set in the near future in the Midwest that follows Brody, a war veteran who wound up blinded in an explosion. He now has special lenses that allow him to see, but the batteries must be charged often. When his batteries go dead, he must wear a sonar device that allows him to see everything in a black and white wire frame. Brody has had trouble with the law, as he has been forced to pay new batteries by beating up men who abuse their wives and girlfriends. That is, until his old friend from the military calls him to help find his sister who has gone missing. This then brings us on a roller coaster ride in which conspiracies are uncovered and each character learns something unexpected about themselves. I was fully engrossed in the story the entire way. I enjoyed the technology references that Post wove into the story. There were only a couple of times that I felt the references to tech in some way seemed unrealistic. I never felt the technologies Post references or invents were unrealistic, which made the story very fluid and the tech didn’t get in the way. There was only one issue I had, and that was with the sheer luck Brody had finding clues. The scene in which Brody finds an Ordi (future cell phones are called Ordis) that is key to him furthering his investigation just didn’t add up. Also, when Brody and his friend search the office building, there were just too many lucky breaks that didn’t add up for me. I would have preferred a more realistic approach to those two scenes. Overall, the book was very good. It was long, but not too long. I doubt I’ll wind up reading this book again, but I don’t read many books more than once. It was a good mystery, conspiracy, sci-fi story that most people should enjoy. My initial response after finishing this book was that it was Epic. I’m not saying it was the best book I’ve ever read, but there was so much that occurred in this book that one could only categorize it as epic. I quickly realized as I read this story that I would need to take some notes if I was to be able to review this story adequately. My memory is pretty good, but there were certain pieces to the story I wanted to ensure I remembered and I knew I wouldn’t remember if I relied upon myself. The beginning of the story jumped right into an immense battle of extreme importance. Watch for the death of a key character by an unexpected set of villains during The Battle of the Burning Plains. This battle begins much of the remainder of the story. Many other authors might have simply saved this battle for near the end of their story and focused much of their attention on building towards it. I liked the confidence Paolini had in his story to throw such a great battle near the beginning. Shortly after the Battle of the Burning Plains we jump right into Roran and his attempt to rescue his true love Katrina from the Ra’zac. This, along with The Battle of the Burning Plains was so enthralling and came so quickly in the book. It was refreshing to have so much action so quickly. After this, I noted that the book started to droll on a bit. One can’t expect to be on the edge of their seat forever I guess. It took until about page 300 to get back into some real action which by this time was much appreciated. The other thing that bugged me was the the seemingly new style of narrative from the Saphira. Paolini had her speaking in very choppy hyphenated speak which was truly odd. I don’t remember it being in the first two books this style of speech that the dragon takes on. To me, it was distracting and there wasn’t any real explanation as to why she had begun speaking like this. I enjoyed the moment Eragon is tasked with replacing Zar’roc for reasons you will find out in The Battle of the Burning Plains section of the book. He is forced to choose a dwarf made sword which of course doesn’t suit him very well. Eragon must alter the way he fights because of the lower quality weapon. The portion of the story I was most impressed with, however, was when Eragon receives his own sword, made for him. This, in my opinion, was fantasy writing at its absolute best. Paolini wove a beautiful story that recounts the actual forging of the sword along with the most unique method for performing the feat which in my opinion will go down as the most creative piece of fantasy story telling I’ve experienced thus far. 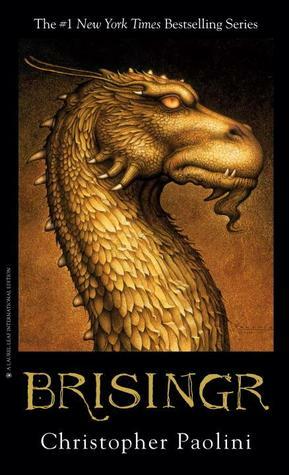 It is truly difficult in this saturated Sci-Fi/Fantasy genre to come up with something truly unique and I feel Paolini did so magnificently with this portion of the story. I’m still debating if I would consider this the best of the 3 of the Eragon books I’ve read thus far. It is definitely very close to the best. Even the lull in action was more than forgivable and some of which was explained later in the story to give reason to the need for the details. I would highly recommend reading this book (read the first 2 before of course). This is the 3rd short story in the series of short stories in this book. Click Here to see the first review and a link list of the other stories I’ve reviewed in this book. When I finished this story, I literally had chills that went up and down my spine. Not because it was a creepy story, but it truly moved me. It was a very mysterious and captivating story. This is the a story of a moment in a young woman’s life. A seemingly meaningless phone call that eventually turns out to be a foreshadowing of the future of her life and the world as well. Hala, the girl, is late for class but takes a phone call on her cell from an unknown caller. For such a short story, there was just so much there. I couldn’t wait to find out who called, what it meant, and how was Hala going to respond. If you get this book and only read one of the short stories inside, read this one. I’m surprised just how much I liked it. I’m going to come right out and say that this story was weird. No, it was beyond weird for me, it was bizarre. I fear I missed the symbolism or creativity Kij Johnson was looking for. It was simply too strange for my liking. The story follows a female fox who has fallen in love with a man. We follow this fox as she and her family create fox magic to make her appear as a woman to this man. She eventually marries this man and has a child with him all to have the man eventually be taken away from her. This was a very difficult story to read. I wasn’t able to get past the fact that Johnson is essentially writing about animals tricking humans into falling in love and mating. 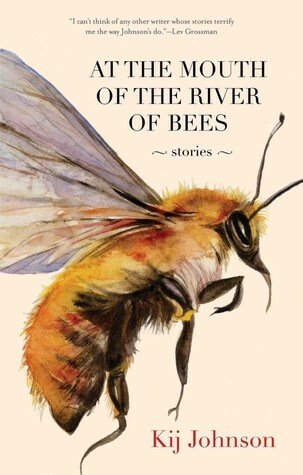 Considering how good the first story was in this collection of short stories, I’m hoping this was just a fluke. Not a good story in my opinion at all. In this, the final stanza of Suzanne Collins’ tale of Katniss Everdeen, we return to Panem and the beginning of the rebellion and the war against the Capital. The story picks up shortly after Katniss is rescued by the rebellion from the arena of the Quarter Quell and brought back to District 13. Throughout the first half of this story I continually found myself annoyed with Katniss. She seemed so weak, and unwilling to take control of her own life; waiting for others to determine her place, her destiny. The internal battle she fought to find her own path was wonderfully told, but I did find I had to keep reminding myself that Katniss is just a teenager, not an adult, though I’m sure many adults would struggle with these choices as well. Collins weaves a tale of brutality and anguish that is quite surprising, namely for a story meant for young adults and teens. I truly appreciated the detail and violence both in District 13 and in the battle for the capital. This reality is shoved at the reader who all too often expects a happy ending and is forced to acknowledge that life is filled with disappointment, hurt, and even evil. I found myself wondering how I would act in a world like Panem. The sheer darkness of this book is refreshing in a world that too often forces us to try to put a happy spin on everything. As we are introduced to District 13 and the future leaders of Panem, it is obvious that the plan for a new government run by the districts has the potential to be just as cruel as the Capital. This fact is slowly realized by Katniss, who now has to choose who’s side she’s truly on. This was a fascinating journey and Katniss’ final action, where she shows all where she stands was surprising, yet believable. The reaction from the new leadership to Katniss’ choice showed a glimmer of hope for mankind in Panem. This final chapter of “The Hunger Games” trilogy was by far the best with a surprisingly acceptable ending. All too often some books aren’t able to end a good story or the story ends with a strategy to leave it open for another book. This story required not a happy ending nor an apocalyptic one either, but more so, a realistic, believable ending which is what was provided. I will definitely read this story again sometime, which is saying quite a bit for me. I strongly recommend this book, but I also recommend parents be mindful of their younger children reading it as this book is much more violent and graphic than the first two.